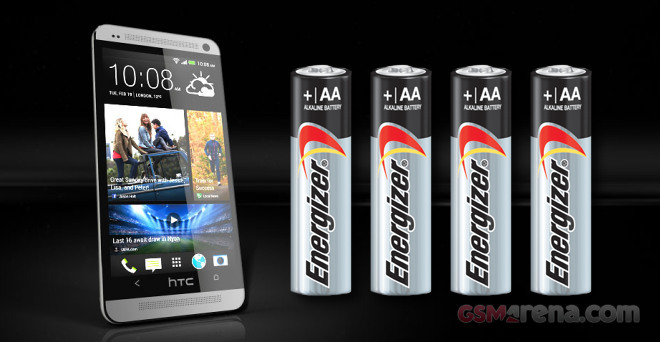 The HTC One is powered by a 2300 mAh Li-Po battery unit that handles the latest quad-core Snapdragon 600 chipset. So, how did the HTC One do? Here we go. Our first battery test is all about 3G calls. 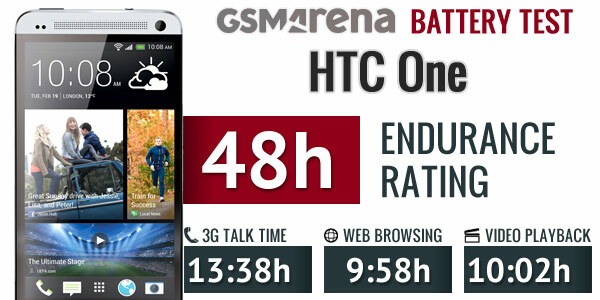 The HTC One battery went out after 13 hours and 38 minutes, quite an impressive result and very close to the Galaxy S4′s talk time despite the 300 mAh battery advantage of the Samsung flagship. HTC One did an amazing job with the web browsing test. It outlasted every other smartphone we’ve tested so far and took the first place in the chart coming just a couple of minutes short of the 10 hours milestone. Nicely done, HTC. Finally we’ve put the One into an endless video playback loop to see how long it’ll take for it to lose 90% of its battery charge. We were in for yet another impressive result with the HTC One matching the Samsung Galaxy S4 and the Apple iPhone 5. The battery drained after 10 hours and 2 minutes, which is quite an impressive result sufficing for sixth place in our all-time chart. With the kind of performance we witnessed in the indivudual tests, we were preparing to see the HTC One post a record overall score. Alas, the smartphone was led down by its standby efficiency and only manged 48h. That’s as much as the Sony Xperia Z, but seriously short of the Samsung Galaxy S4 achievement. This means you’ll only need to charge the HTC One every 48 hours if you use it for an hour of talk-time, an hour of web browsing and an hour of video-watching per day. If you are a power user you will probably get similar mileage from the HTC One and its two main rivals, though. Besides if HTC finds a way to address the less-than-stellar stand-by efficiency with a firmware update, the One will last over two days for moderately heavy users, too.